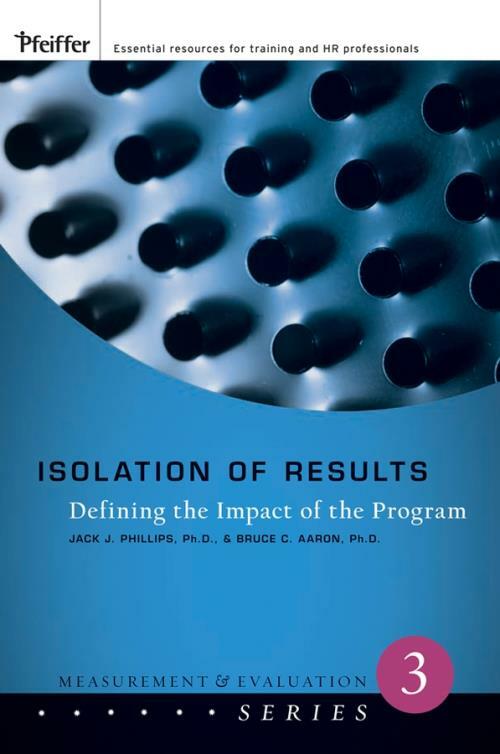 Isolation of Results is the third of six books in the Measurement and Evaluation Series from Pfeiffer. The proven ROI Methodology developed by the ROI Institute provides a practical system for evaluation planning, data collection, data analysis, and reporting. All six books in the series offer the latest tools, most current research, and practical advice for measuring ROI in a variety of settings. To bring credibility to a project it is vital to isolate the effects of a program on business data. Isolation of Results focuses on this critical topic, arguably the most valuable part of the ROI Methodology. The authors acknowledge that other factors can influence results, and this important resource shows a variety of ways in which the effects of the program can be isolated from other influences. The techniques presented include the most reliable and rigorous approaches and also contain the more subjective methods. Isolation of Results offers a comprehensive review of the topic and contains information about using control group arrangements, trend line analysis, forecasting, expert estimation, and adjustments. The book also addresses issues of credibility of the method. Principles of the ROI Methodology. 1. The Importance of Isolating the Effects of Programs. Challenges in Understanding a Program′s Impact. Case Study: What Caused the Improvement? Preliminary Issues in Isolating Program Effects. Pager: Please do not italicize the Contents H1 items or the sublists to this level. The Need to Isolate Program Effects. Chain of Impact: Initial Evidence of Program Effects. Identification of Factors Other Than the Program: A First Step. 2. Use of Control Groups. Issues When Considering Control Groups. Problems with Control Groups: A Case Example. Control Group Example 1: Retail Merchandise Company. Control Group Example 2: Federal Information Agency. Control Group Example 3: Midwest Electric, Inc.
Control Group Example 4: International Software Company. 3. Use of Trend Lines and Forecasts. Trend Line Analysis Example 1: Micro Electronics. Trend Line Analysis Example 2: Healthcare, Inc. Trend Line Analysis Example 3: National Book Company. 4. Use of Expert Estimates. Participants Estimates of Program Impact. Using Focus Groups to Obtain Participant Estimates. Using Questionnaires to Obtain Participant Estimates. Using Interviews to Obtain Participant Estimates. Advantages and Disadvantages of Participant Estimates. Pager: Please style the following items as a sublist to the previous list. Immediate Managers Estimates of Program Impact. Senior Management s Estimates of Program Impact. Customers? Estimates of Program Impact. Experts Estimates of Program Impact. Determining the Impact of Other Factors. Estimate Example 1: Global Financial Services. Estimate Example 2: Cracker Box. Estimate Example 3: Public Bank of Malaysia. Estimate Example 4: Multi–National, Inc.
Key Issues in Using Estimates. 5. Use of Isolation Techniques. Matching Exercise: Isolating the Effects of a Program. National Computer Company, Part A.
Pager: Please style the following items as a sublist. National Computer Company, Part B. National Computer Company, Part C.
National Computer Company, Part D.
Why Isolation Is a Key Issue. Other Factors Are Always There. Without It, There Is No Business Link: Evidence Versus Proof. Other Factors and Influences Have Protective Owners. To Do It Right Is Not Easy. Without It, the Study Is Not Valid. Build Credibility with the Isolation Process.